In a 2010 fund account raid – for the ostentatious purpose of making two domestic spending bills appear “budget neutral” – House and Senate Democrats “borrowed” roughly $14 billion allocated for future SNAP benefits (Supplemental Nutrition Assistance Program AKA food stamps) that were put in place by the 2009 stimulus bill. No need to worry, though – Democrats super pinky swore to replace the funds before the cuts begin to materialize in 2013; the original plan being to let them inflate away by 2015 as food prices catch up, in order to avoid an abrupt drop in benefits. "We thought it was bad two years ago and it's only getting more bleak," Elizabeth Lower-Basch, a senior policy analyst for the Center for Law and Social Policy, told The Huffington Post. When Democrats promised in 2010 they would restore food funding, Lower-Basch said at the time she feared they wouldn't find a way. "It didn't take a particularly good crystal ball." Now, let’s return to the present day to examine the source of additional cuts. Last week the Senate passed something called the 2012 Farm Bill with overwhelming bipartisan support. So, what’s in this bill that concerns food stamps? It can’t be too bad with respect to the “overwhelming” bipartisan support. Right? 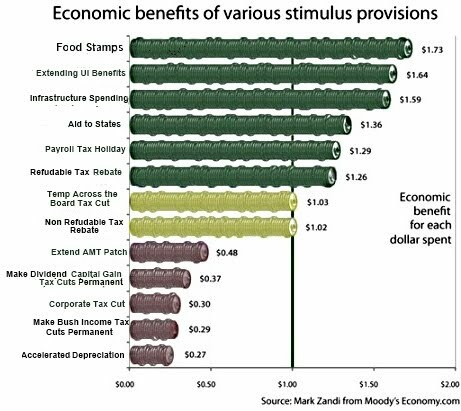 Well, the omnibus spending legislation contains provisions for funding the food stamp program – roughly $80 billion a year. 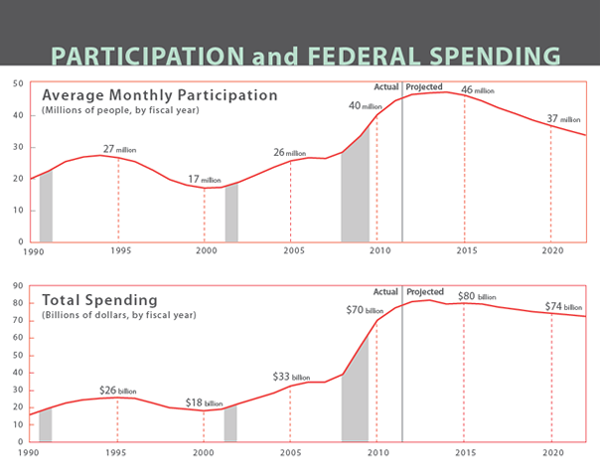 Along with making several other cuts in the name of “wasteful spending,” the bill cuts about $4.5 billion from food stamp funding despite the fact that over 45 million people a month received benefits last year: a 70% increase over 2007 and a statistic that is expected to continue rising through at least 2014. In order to justify cutting a program whose only crime is helping to feed society's most vulnerable, conservatives have chosen to fall back on their tried-and-true tactic of decrying the program as being an epicenter of fraud and waste. They lament that fraudulent SNAP claims are being filed by people categorically eligible through the "Heat and Eat" program; under the program, states can send beneficiaries nominal $1 dollar utility assistance checks so that beneficiaries may be eligible for federal assistance through SNAP. To be clear, what conservatives are decrying as "fraud and abuse" is a program whose average beneficiary takes home an annual income of $8800, even after the alleged “fraud.” Not only that, but these fraudsters have the audacity to receive $4.30 a day for the purchase of basic sustenance! Clearly, these welfare queens are living large at the expense of hard working taxpayers: caviar and champagne all around, indeed! Despite the cut, there is more to this narrative that does a fantastic job highlighting the illegitimacy of Congress as a reasonable policy-making institution. Faced with the opportunity to restore the $4.5 billion cut to SNAP via amendment, the Senate refused to approve it by a margin of 33-66, with bipartisan support on both sides. What was so terrible about the amendment that precluded it from being adopted? It sought to cut “guaranteed profit for crop insurance companies from 14 to 12 percent” and lowered payments for crop insurers from $1.3 billion to $825 million for the purpose of preserving the bill’s budget impact. Only to add to the macabre hilarity is that the bill is framed as promoting fiscal health through budget cuts; as is relatively common knowledge, food stamp programs provide literally the highest level of economic stimulus – roughly $1.73 per dollar spent – whilst corporate tax cuts provide a return of a paltry $0.30 per dollar spent – the bottom of the barrel. In short, there are 66 Senators of both parties who would rather see children, the elderly, and the disabled – which comprise three quarters of SNAP beneficiaries – go hungry, so that our corporate welfare system can prop up crop insurers with 2% additional profit. If we are to accept the charitable premise that Congressional legislators are at least intellectually fit enough to be able to process very basic economic concepts, never mind govern the country, the only lesson that can be gleaned from this display is that at least two-thirds of the Senate is outright spiteful towards – if not willfully working to exterminate – our most vulnerable Americans.